Note: The Test for File Existence file does not need to be an actual file with an extension. Testing for the existence of a folder is also valid. If the Alert test is triggered (true) and returns records, the Alert result request is processed. You have the option of creating the result report or selecting an existing Managed Reporting report you are authorized to run. Alerts Created in Developer Studio. If you select WebFOCUS Test in Developer Studio, you are prompted to create the Alert test using the reporting tool. You can also choose the Editor. If you select the Editor, be sure to keep the TABLE request simple. The TABLE request should only contain the fields to evaluate the condition and an ON TABLE HOLD statement. When you save the request, it is validated to ensure you have included the ON TABLE HOLD statement. You can create the Alert result or select an existing Managed Reporting report. Considerations: One consideration when creating an Alert is the flexibility of editing the Alert result. It is recommended that you select an existing report for the Alert result request, as it is available to edit, run interactively, or schedule independently of the Alert. If you create the Alert result using Developer Studio within the Alert Wizard, you need to use the Alert Wizard and select the open option again to edit the request, because the Alert test and the report to be run are contained within the Alert procedure. Once an Alert is created using the browser or Developer Studio, it is stored in the WebFOCUS Repository. In the sample code that follows, an Alert test is created with the Editor and a report to be executed is created with Report Painter. To keep the sample code simple, styling and report options, such as report headings and conditional styling, are not included in this request. Notice that after the first TABLE request there is a –IF statement that checks if the number of lines in the report is equal to zero (–IF &LINES EQ 0). This checks to see if the Alert should be triggered (true). If the number of lines is greater than zero, then there are records that satisfy the Alert test and the report is executed. This test condition determines if the second TABLE request, to execute the report, should be triggered (true). The Managed Reporting developer, using Alert Assistant or the Alert Wizard, creates an Alert test and designs the report to be run if the Alert condition is true. The Managed Reporting developer, using Alert Assistant or the Alert Wizard, creates an Alert test and designs a report to be run if the Alert condition is true. 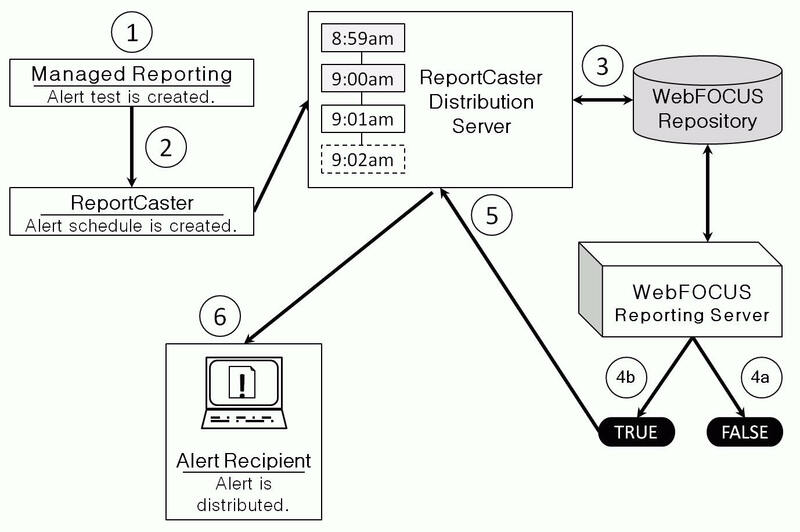 The ReportCaster Distribution Server distributes the Alert result to the specified recipients, and allows you to specify various scheduling options. The report is received by the recipient.